Although the care of brass instruments is not difficult, few of us clean them as regularly as we should. All brass instruments get along well with mild soap and water. Putting them in a bath tub and giving them a bath with dish soap and a soft cloth will work fine for all brass instruments. And, that is all you want to do to the exterior of a lacquered instrument. For silver plated instruments and unlacquered brass instruments, you can also polish them as a middle step. For Silver instruments, use a good silver polish such as Hagerty's, For unlacquered brass instruments use Wright's Brass Polish or Brasso. For instruments that have lost some of their lacquer, you can use brass polish on the bare spots to improve their look. After polishing wash the instrument off again. A sink with a kitchen hose is ideal for flushing out the tubing. 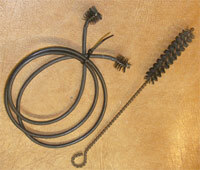 In addition a brush on a flexible cable will be useful. Additionally for straight sections of tubing a rifle cleaning rod, or even a piece of wooden dowel with a hole cut in the upper end to slide cloth through will clean the interiors of tubes. If using a steel rod to keep it from scratching the solfer metal, it may be a good idea to cover the length of the rod by wrapping cloth the whole length and also covering the end of the rod. With a cloth on the cleaning rod, be careful you don't get too much cloth inserted into the tube. When you pull back on the rod, the cloth will get tighter in the tube than it was when pushed in. So, use a little soap, some water pressure, a bit of rubbing, and the insides of your horn will be certainly cleaner than when you started. And, if done regularly, it will keep the insides clean. However, older horns that have been neglected for a long while will develop deposits that will require some help from chemicals and your repair service to get cleaned up. Anything that doesn't come apart or go back together easily probably means that something is wrong. Pay attention and be sure you know what the problem is before forcing anything. Cross-threaded valve caps can make a small problem a much larger one if forced. Repair shops have tools made of steel that can force threads back into position because the steel is harder than the brass. When you try to make a valve cap straighten threads, you are using brass to straighten brass and they are of equal hardness, so it is just as likely to make things worse as it is to make them better. If slides, pistons, or rotaries don't move smoothly, something is wrong. Often is is just a bit of debris that can be cleaned out. Don't place too much faith in oil. Moving parts should work reasonably well without oil. If they do not, then there is another problem. Don't use any pliers with teeth on your instrument or mouthpiece. They will damage the part, and usually don't help remedy the problem anyway. Strap wrenches, if used carefully, can loosen stuck mouthpieces, however, too much force is likely to twist the tubing of the mouthpipe. 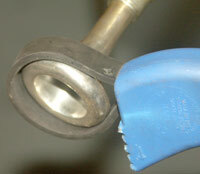 Penetrating oil such as WD40 or PB Blaster can help loosen stuck mouthpieces and stuck tuning slides. Stuck slides should be pulled with a piece of cloth or leather. Again be careful, you can pull tubing loose or twist it. Don't overdo the use of lubrication. And, then use the part that is lubricated. Areas like valve cap threads probably shouldn't be lubricated. Periodically move your tuning slides to make sure they are not stuck. Use good quality lubricants. Some of the products for trombone slides in particular are simply awful. I recommend Slide-o-mix for trombone slides, and Al Cass or Hetman oils for valves. For tuning slides, Hetman also makes a tuning slide lubricant, or you can use lanolin.